When it is hot outside, nothing quenches your thirst quite like a refresher from Starbucks, a lightly sweetened fruity drink that really does live up to its name. Starbucks has had both powdered (Via-style) and canned versions of this popular drink for quite some time, but they’ve added some new options to their lineup. 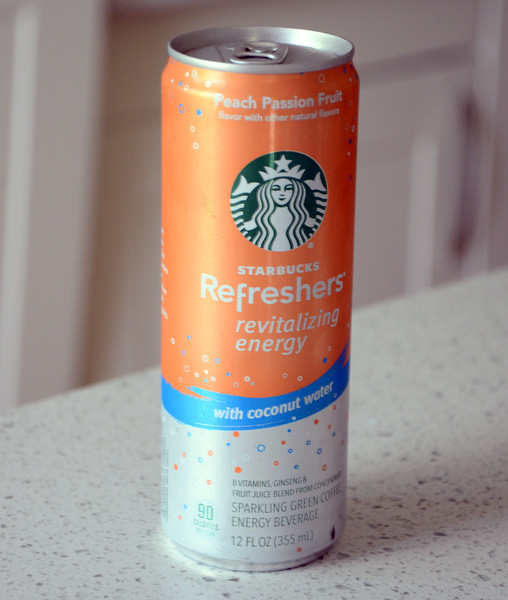 One of these is the Starbucks Refreshers Revitalizing Energy with Coconut Water, a new drink that comes in two flavors: Peach Passion Fruit and Cherry Limeade. The drink is slightly carbonated and meant to offer up a slight energy boost, as well as refreshment. I really enjoy coconut water and the fact that it was included in the Refresher appealed to me right away, as did the tropical combination of flavors (side note: there should be more tropical options at Starbucks). The drink is lightly sweetened and reminded me of the peach green tea lemonade (another summer fave) due to the fact that the peach flavor was dominant and the more citrusy passion fruit played a supporting role. If you are a regular coconut water drinker, you’ll also notice the lightness that the coconut water gives to the drink. The carbonation was mild and pleasantly refreshing. Though you can’t really taste it, the caffeine in this is boosted with green coffee (as it is in all refreshers) and ginseng. I wouldn’t reach for one if I really needed an afternoon pick-me-up (pass the cold brew, please), but wouldn’t hesitate to go for another on a hot day!